As previously disclosed, Walter Rothwell passed away January 21, 2016. Wally’s remains were cremated, and he will be laid to rest in the military cemetery in Fort Huachuca (near Sierra Vista), Arizona. Per his wishes, his ashes will be buried in his wife’s grave in a family ceremony at 12:30 this Friday, February 19th. The ceremony will be attended by a small contingent of U.S. Army soldiers in recognition of his military career for 22 years following World War II. As Wally lived, Wally thus has passed away … graciously and inconspicuously. For those who knew him or who loved him, this will be a quiet farewell for a very interesting and special individual. Can silence can be louder than noise? In Vietnam we marines got used to odd sounds, clamors and clatters, screeching noises, thunder, blasting metallic crunches, ground-rumbling earthquake-type poundings, rifle pings and pops, the perpetual commotion of choppers’ whop-whops and jets’ discharges, rata-tat-tats, and who knows what else? It was always around us, always there. 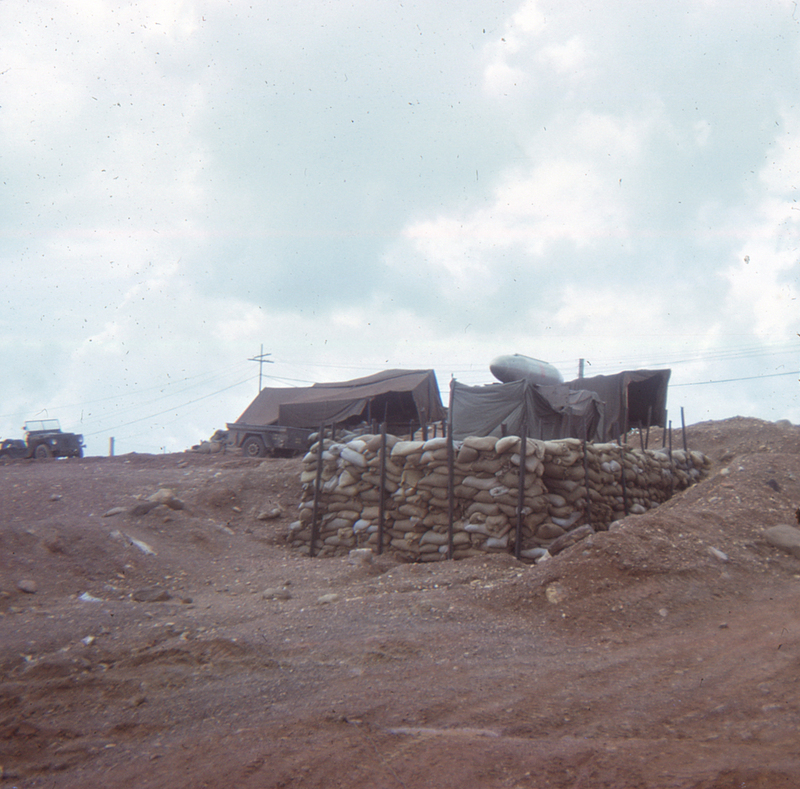 Even so, in Khe Sanh, such din became commonplace. It was always there, but kinda like a radio’s volume knob being adjusted way up or down by acts we usually couldn’t actually see. It made a guy jumpy because we couldn’t always know what it meant. Nevertheless, in another way, it was unconsciously comforting because routinely we knew these were our weapons, our planes, our helicopters, our own actions. In the book Just Dust (for more information about this book, go to Amazon.com), I talk about how repetitious certain sounds became …so repetitious that we quickly learned how to sleep amid this racket. Sleep, after all, was so very precious. Such jarring shakes and spiky bangs actually could lull one to ponder the strangest wafting dreams, escorting us to whiz away into slumberland without fear or distress. In the book, Just Dust, however, I recount an event far less ordinary. After all, sometimes sounds do change. Incoming mortars, for example, had their own unique jet engine-esque hissing roar trailed by explosions and whooshing debris colliding with nearby objects or even unsuspecting marines just lying in their bunks. As these pounding smashes grew louder, we recognized these mortars were being “walked in” toward us. We had to act right then and there, and we did. Then on other occasions, the rapid pings and pops of gunfire zinged or buzzed past us …we all knew what was happening; and, our alertness switch toggled “on.” We ducked. We hit the dirt. We splashed. But there’s a segue I talk about in Just Dust where all of these familiar but antagonistic sounds played a different role. A significant part of this particular story had less to do with mere preparation or endurance as it did with outright survival …not just avoidance of death, mind you, but how the act of being spared played out with many other events that followed (the effects of post-traumatic stress disorder need to be considered in situations depicted in this event). Silence was the shapeless trigger that night, and a shadowy tattoo-like companion for me thereafter. Do you go fore? Or, do you go aft? Can one can surmise much by watching people, or watching what people look at? Whether at a shopping center, a bar …or aboard ship like I was …watching their eyes caught my attention. 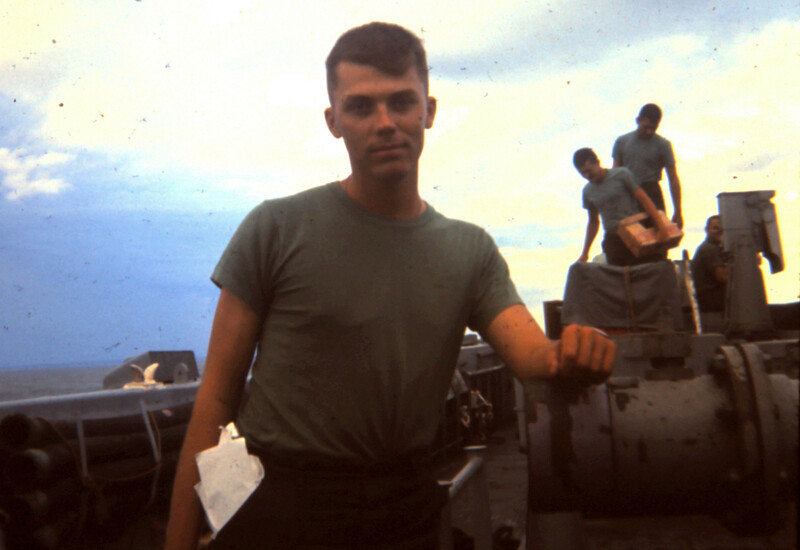 I write about an event in my book, Just Dust, that occurred as we were swishing out of port from San Diego aboard the USS Vancouver, sister ship to the USS Iwo Jima (LPH-2), in 1966 on our way to Vietnam. As we migrated toward top deck to witness this departure event, we clumped up on the metal “up” steps then quietly exited out. Mixed conversations were replaced by eyes darting left and right once our voices were brushed with open tropical air. Taking it all in, we congregated into smaller and smaller groups until, it seemed, we were standing isolated, alone but in a loose crowd, and not talking at all. The sun was just then kissing the horizon. Half the marines were moving toward the bow starboard consuming unknown lures yet to come with squinting eyes …with the other half at the stern, watching the sun’s reflections bounce off San Diego skyscrapers growing smaller into the eastern dusk. By now, the sun was an orange half-sphere. So many unknowns. Were these high-eyebrowed guys upfront motivated by thresholds to be crossed, first time anticipations yet to come? Were pursed-lipped guys at aft reminiscing of home and family, of people and things left behind? A hefty breeze from the north lifted my cap off my head as the somberness of departure overcame my own mood. Once I retrieved my hat, I walked to the handrail amidships where I, now completely alone, could contemplate both east and west simultaneously. Either one way or the other, in less than a minute everyone else had now ambled away. I was the very last one left to decide. Guys don’t talk about these things much; yet, I watched their eyes. I write about this in my book Just Dust. So many of these contemplations are buried inside, and not easy to retrieve. Somberness wasn’t the right word, though. This event was an unguarded gesture of dignity. It was like we were watching while being watched. After all, we were trained. We were fit. We were ready. Uniforms were clean, shoes shined. Our blood ran fast even at rest. Was it respect for undisclosed fears? Was it a come-and-get-it fist-thumping inside our chests? Or, was it a form of resignation? Most of us had not proven prowess or adulthood outside those San Diego or Tijuana bars; even then, those were the kind of victories we’d already learned in high school. This was different. Our choices had become consequential. Whether we were prepared or not, we were en route to that vast unknown called Vietnam that we had read about in the newspapers …that place where Walter Cronkite reported the explosions and deaths d’ jour on the 10 o’clock news. We were actually en route to that very same place. Yeah, we knew where we were going, but now the act had actually begun …the journey, commenced. Who might not come back? But emotions are disguised by most young men; it’s after all, unmanly. We were proud, we were able, we were willing. But there was no one to comfort my own pensiveness at this moment. I raised my eyebrows, squinted, then walked to the bow.